Thanksgiving evening as we set around holding our bellies, my step father, Bob and I anxiously watched the weather. 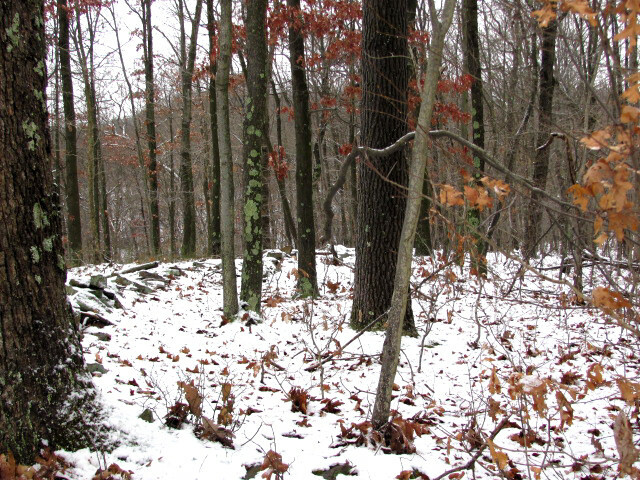 We were planning to hunt turkeys the following morning so we hoped for a good coating of snow. The forecast was the snow was to be flurries only. I was hopeful tomorrow we would find tracks and the birds easily. There was an hour and a half of evening time when the snow was sparse. I was grateful we had that time frame for turkeys to move around prior to going to the roost. They can make a lot of tracks within that time. The plan was to start a diagonal cut across the woodlands with me maneuvering with zigzags to cover a lot of territory and find those tracks. However, the plans were to be changed for the expected flurries overnight had become enough to cancel out any evening tracks. the plan, now, was to do the same, but my zigs were going to need to cover much more land than my zags. 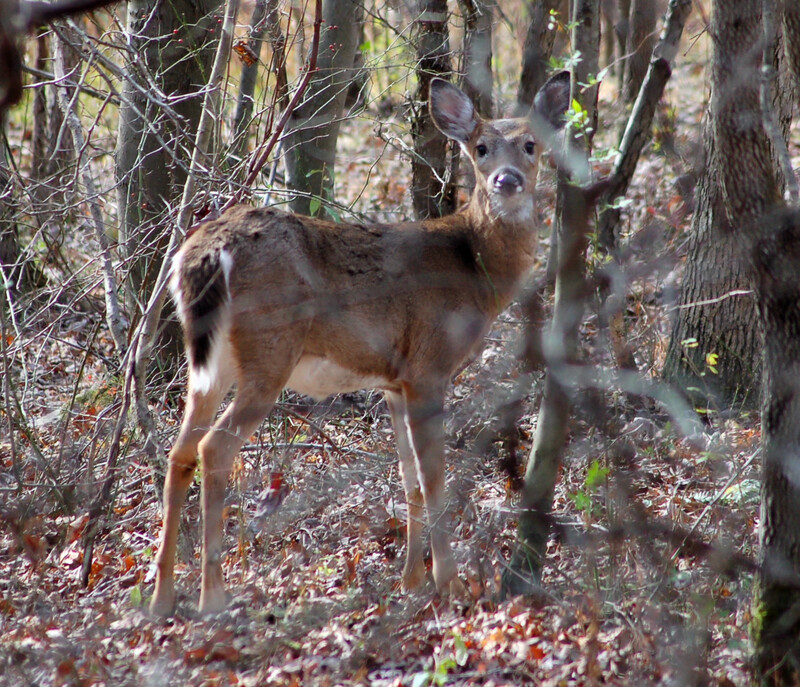 Everywhere I walked deer were present. Bob saw some too. 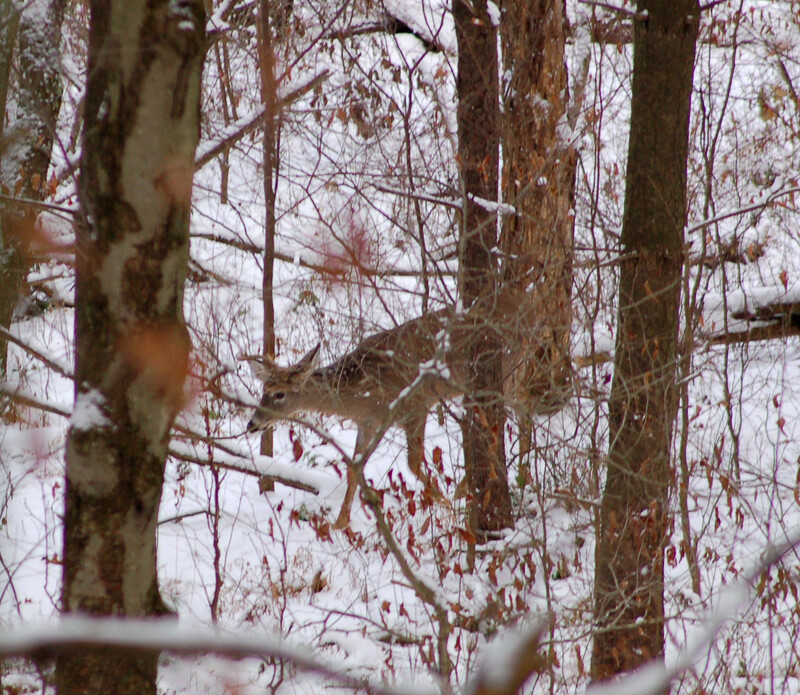 I kept him on the flatter ground as much as possible as I watched for birds or tracks. We met up occasionally to alter plans as needed. He was to stay high and return towards a certain area as I walked around over the sides. I turned to make a change in direction and there were turkeys and close. I hollered and moved as fast as I dared. Some turkeys flew and others ran. I knew I had not the best of breaks, but I located Bob, and the eighty year old, had to, quickly, walk down over the hill’s side now. We set up and after a bit of time elapsed I began calling. We, later, heard the yelps to our left. The bird answered a couple of times. we waited. I had great concerns of the contrast of Bob and I against the white snow. I had white camo, but Bob didn’t so we sat up among some fallen tree tops. The hen came in and began to sharply putt… her alarm call! We sat for over an hour and I failed to have anymore turkeys respond. Maybe if we could have waited longer??? We froze out and started the trek up and over and to the vehicle. 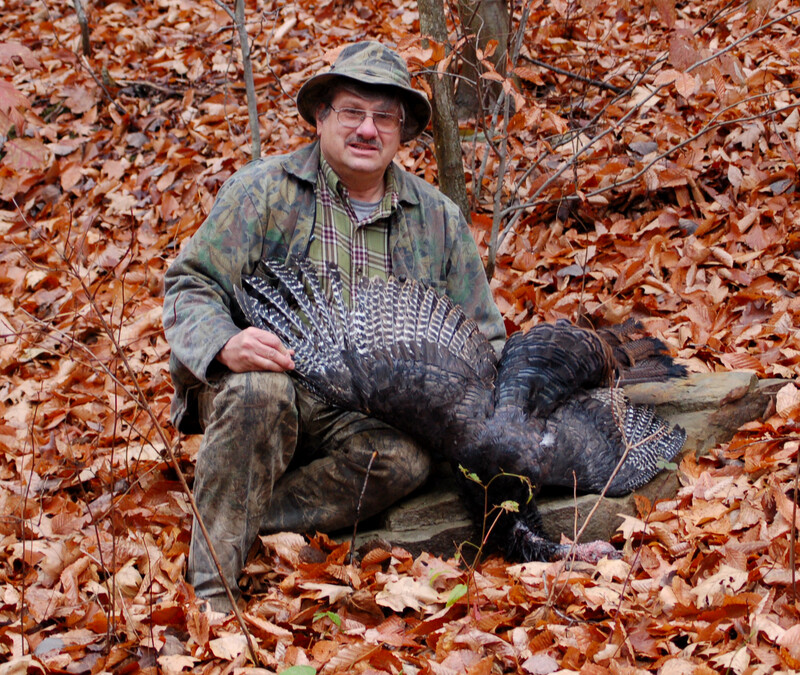 The second week of Pennsylvania’s fall turkey season has concluded. My step-father, Bob and I managed to get out a few hours on a couple of occasions. Unfortunately, we failed to locate the meandering flocks. Notice the rear quarters raise as the deer froze in position. We separated to try to hear birds on the roost. When that strategy failed I began a walk of the area with hopes of walking into a flock of birds or to receive an answer. All my walking failed as well. However, I did see a number of deer including some bucks. We decided to try at an area near my homestead for an hour or so prior to going to the house for some grub. At this site I saw only deer. Our second time out during this last week was a mid morning gathering. We entered and area where Bob harvested a young gobbler a few years ago. Turkey sign was sparse everywhere I ventured on these hills. 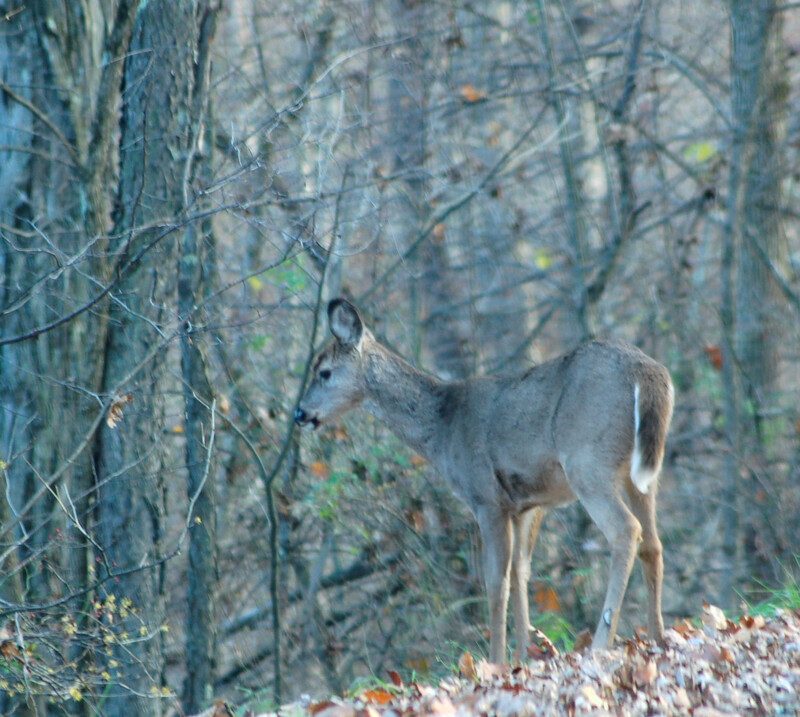 Again, I saw a lot of deer including a couple of bucks. 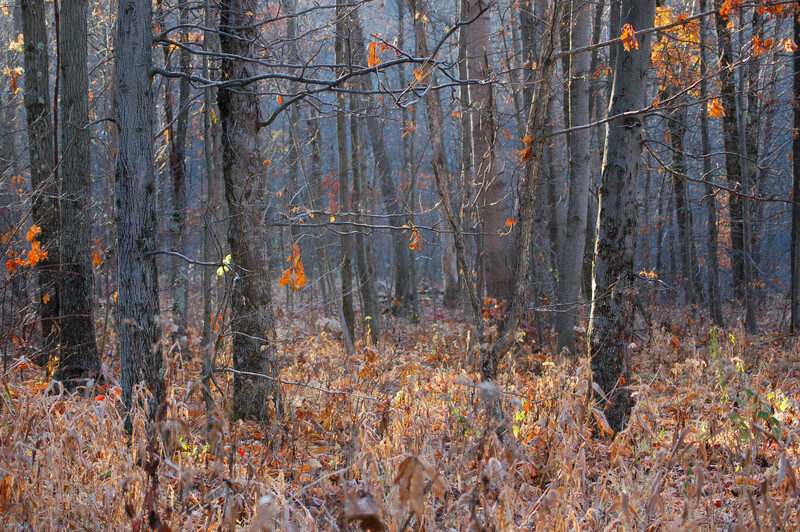 The first buck I saw was discovered as I eased over a ridgeline seeking turkeys. I immediately spotted this buck. he raised his rear legs up in the early stage of bolting. 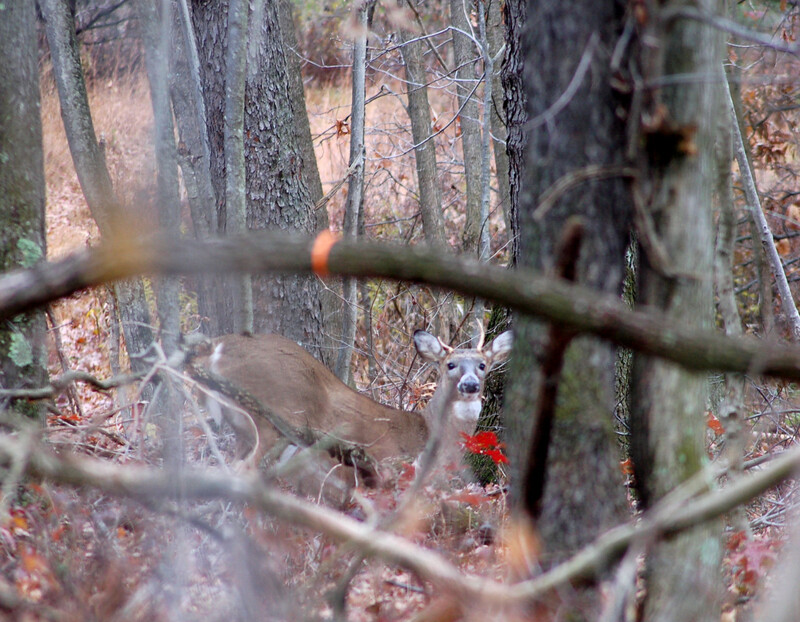 However, the deer stopped this motion when he discovered I was gazing into his eyes. his first reaction was to freeze. 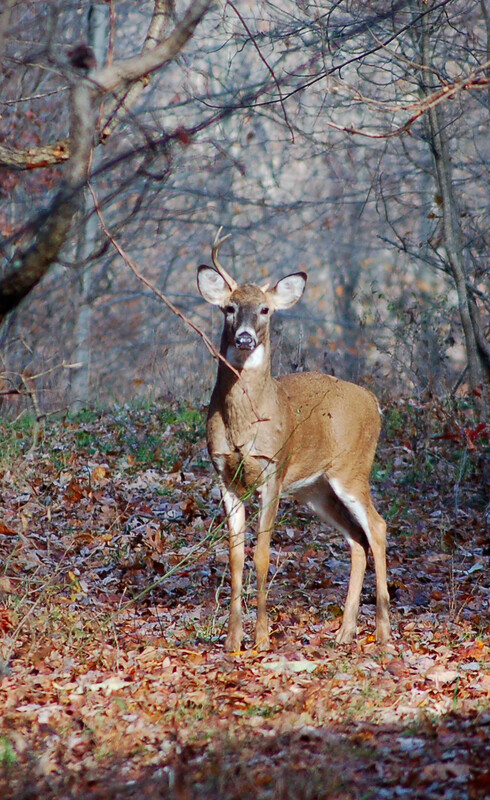 Later into the hunt I spotted another buck with a wide spread in antler width. 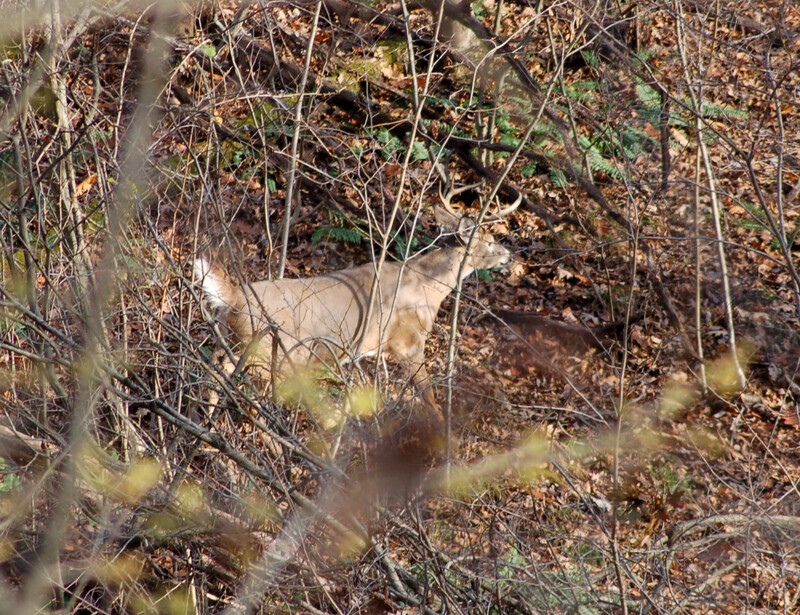 the seven-point allowed a few photos, but brush and movement didn’t permit the best shots. 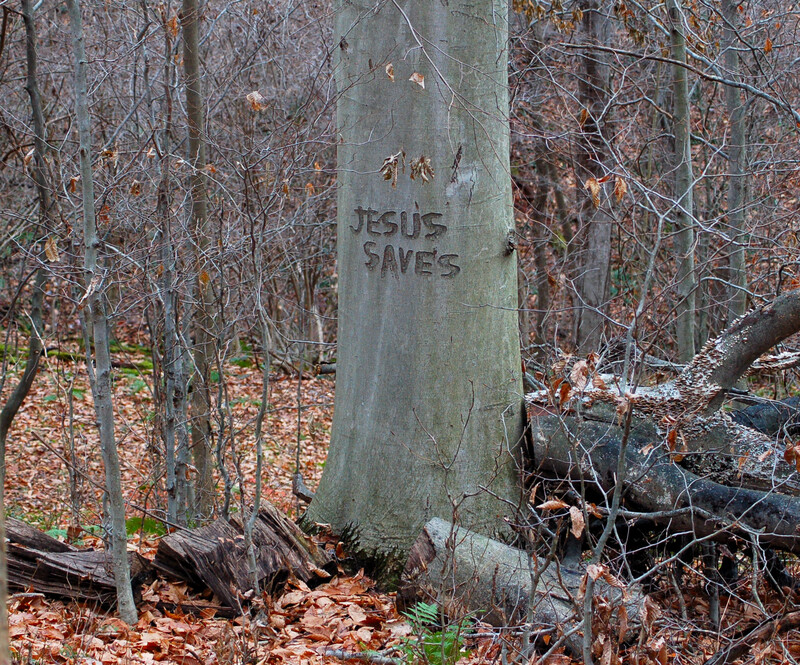 Some interesting sites of these two days were: Watched a squirrel gathering leaves for a nest; bear claw marks on beech trees; great-horned owl and a beech tree with a carving of JESUS SAVES. This was in a hollow I had not been in a quite a few years, at least that far. My next hunting ventures will be sneaking around looking for a bear. Wednesday morning found Bob and I going separate ways again with hopes of hearing turkeys on the roost. We both failed! I began a call and walk approach to try to locate birds. The winds were not as bad, but enough of noise was present to make hearing far away birds impossible. Notice the strong white bars on the tail feathers. 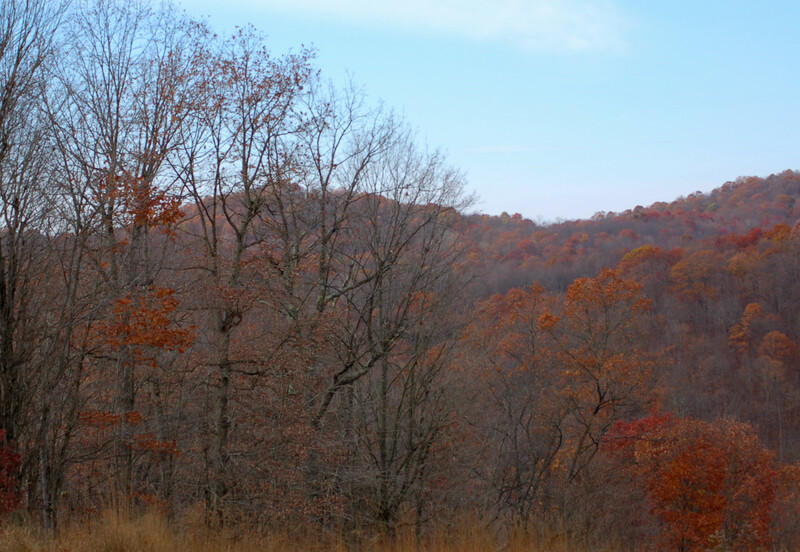 I slowly approached a crest on a hill to observe the back side and was disappointed to not see any turkeys. I then walked downslope and walked below the hill’s rim and, later, as I came back up over I quickly noticed a turkey’s head drop and I immediately began to charge towards it. Five turkeys were in a mad dash up the slope as I hollered. I managed to get a slight break. Three birds went to my right and two went straight ahead. I couldn’t be positive of their gender, but, at least several appeared to be big birds. I walked around looking for a good spot to set and call from. 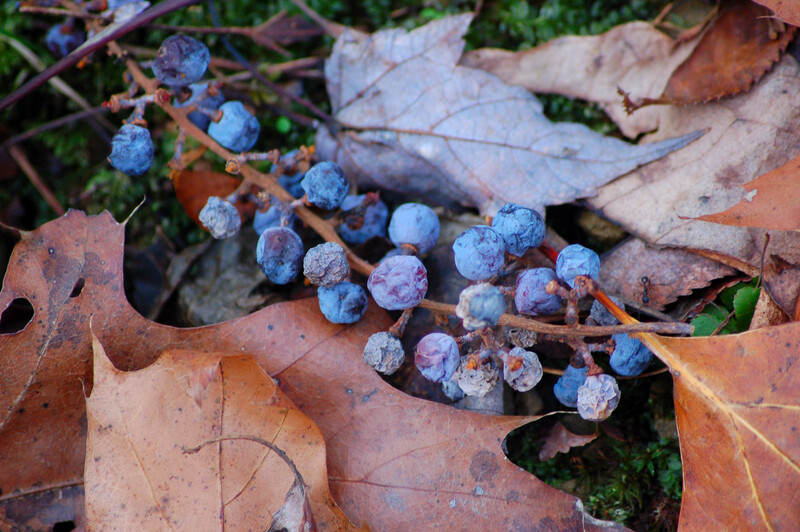 Tree tops littered the forest floor. No matter where I set I would only be able to see in a few directions. 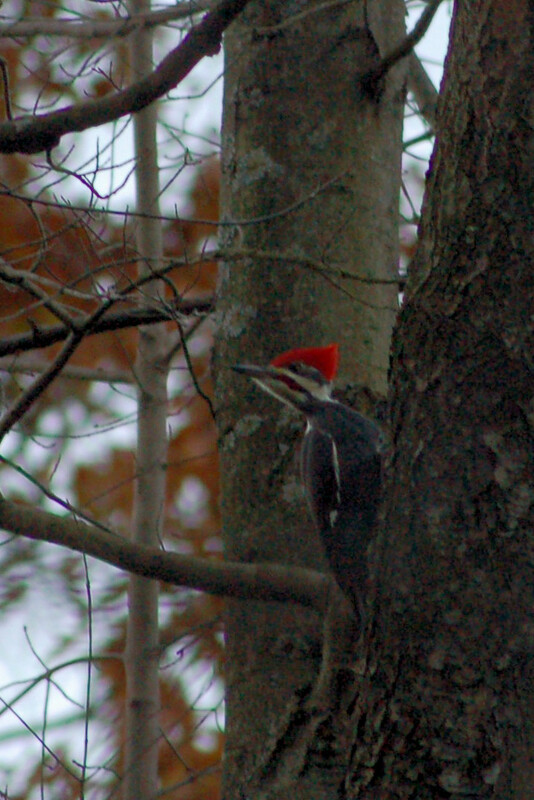 I waited and later began calling loudly to overshadow the noise the best I could. Forty-five minutes later I heard the loud “woody-like” putt of a gobbler. The turkey, you guessed it, came in directly behind one of those tree tops. 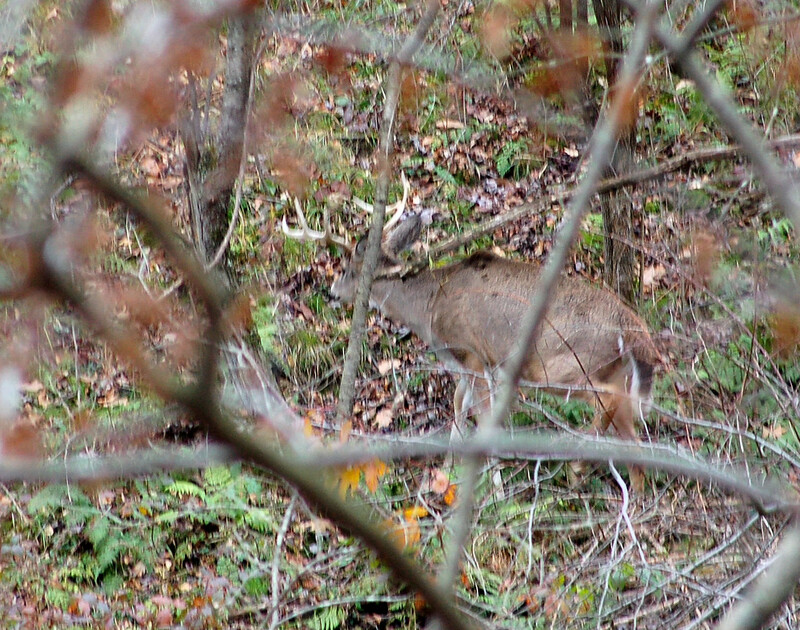 He was only about 15 yards from me and I just couldn’t get a shot. I decided to raised up and try to connect. The gobbler wouldn’t have anything of that blob against the tree (ME!) and soared off down the hill. I remained another forty minutes or so calling. I began to get chilled from inactivity and the wind. Also, I wondered about Bob and decided to hit the brush and find him and, also, get warmed up. I stood up and when I walked behind to go over a slight rise in the terrain….you guessed it! A second long beard took off. Neither bird uttered any sounds as is typical of older birds. They sneak in and watch. This bird was around 35 to 40 yards at most from where I had been calling from!!!!!! I located Bob and we decided to go to another place for a short time before going home for leaf mulching. We saw another turkey fly across the trail. I saw deer and squirrels. This morning I elected to hunt close to my homestead. I intended to make our family tradition of having breakfast with my mother, step father, Bob and my sister Ruthie. I hunted to after 8:00 while being blasted with rain. I saw a number of deer and squirrels and an owl, but I didn’t hear or see any turkeys. After breakfast and my clothes in the dryer, I just couldn’t stand setting and off I went again to see if I could locate a nice bird. 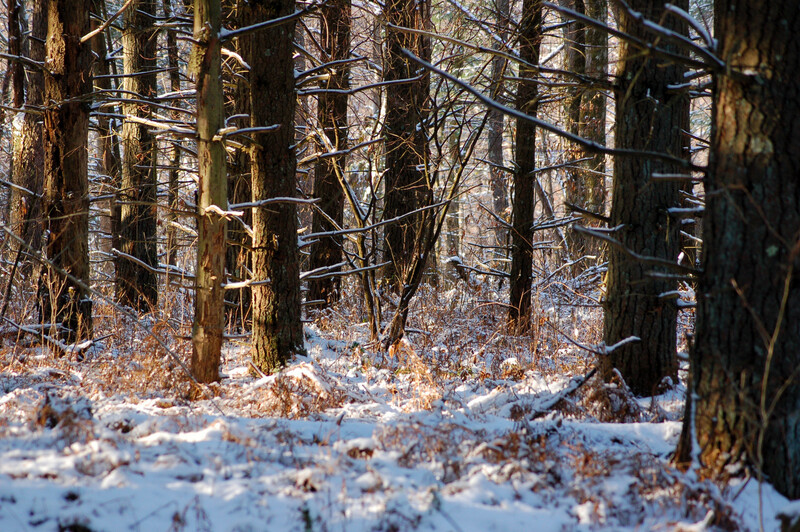 I returned to where I had hunted the day earlier and began a walk and call strategy. About an hour into the hunt I came upon some fresh turkey scratchings. 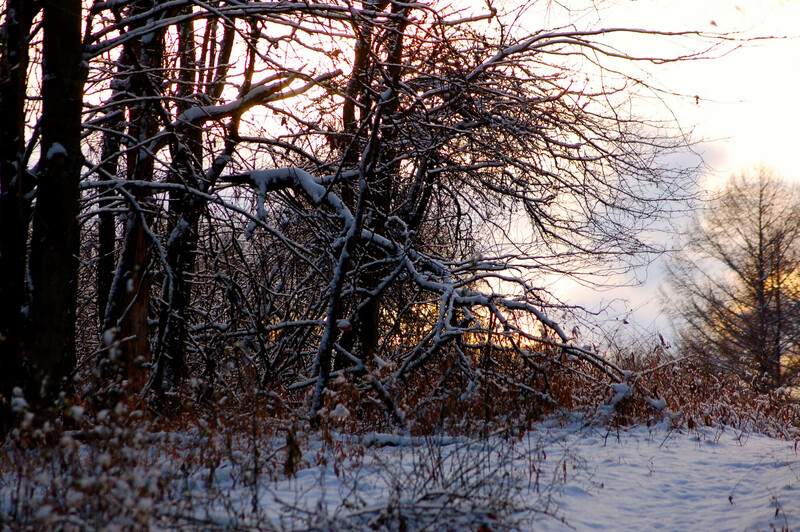 I walked some more and peered into a field and saw ten deer feeding. A short distance further I saw turkey heads moving out in an area with pines and multiflora rose. I started into this mess to break them up and had to stop. I noticed several birds within range beginning to run and I had my 2014 fall gobbler. 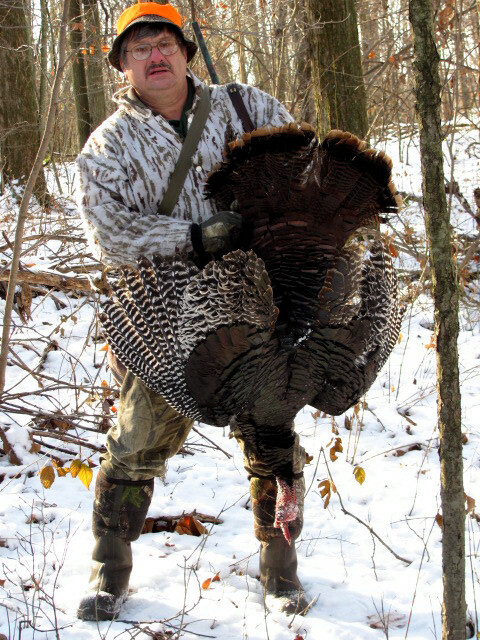 The tom was a gobbler of the year with a short beard. 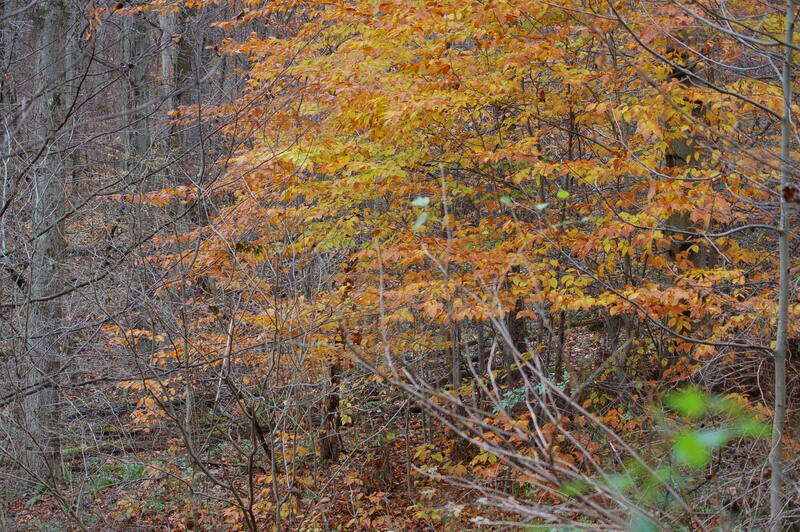 Those beautiful beech in autumn glory! My step father, Bob ad I failed to locate any turkeys on the roost. We, also, failed to find any throughout the morning’s walks. 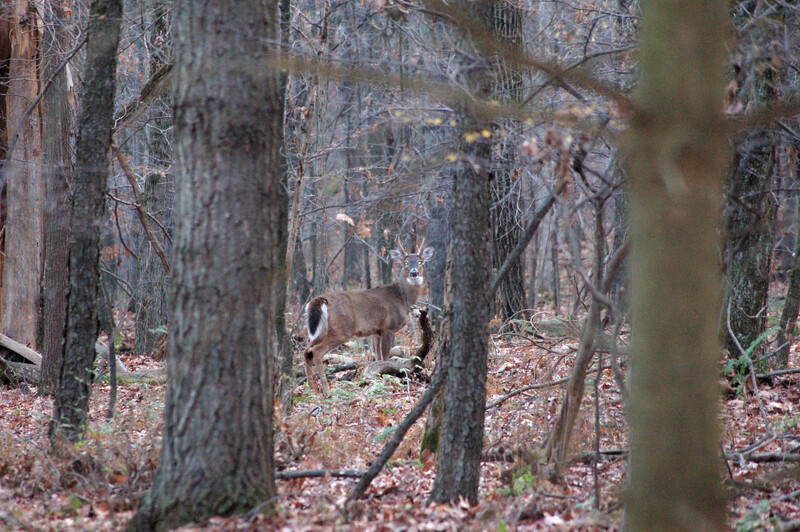 However, I did see plenty of deer, including several bucks. The rut is definitely on as they chased their girlfriends around! Monday, the second day started off very different. I told Bob to walk a gradual ascending gas well road and watch the tree-line for roosted turkeys. This would be easier for him since he is eighty years old! I went elsewhere to do the same. Time hadn’t moved along much when Bob contacted me of 5-6 turkeys flying from the trees across the road and hollow. I hurried over and saw two birds fly off. I suspected two of the original birds landed again. We set up and tried calling. I wasn’t feeling very confident since the birds all flew in the same direction. One needs a good break of the flock to call them back. We did hear some yelps across the road. I would later chase the bird from the tree. We eventually gave up and began hunting around searching for these birds or others. I saw plenty of deer again with some bucks as well. I, also, saw a grouse and porcupine. 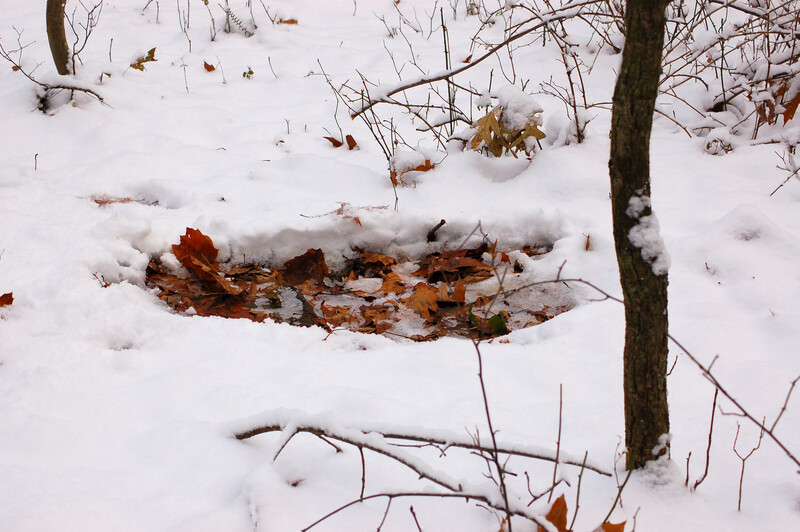 Shortly before noon, I approached a crest on the hollow and spotted a turkey . Surprisingly, the bird, at about fifty yards, didn’t see me. The sun was directly behind me and in it’s eyes. I eased to behind a tree. I removed my orange vest and hat and placed orange behind me a few feet back. As I peered through the V of the tree trunks, I noticed about four birds preening. The hazel made seeing them difficult. I tried a few very soft calls, but they were busy settling their feathers. I continued watching when the turkeys started feeding. Other birds became visible. I called again and clucks and yelps resulted. I could, now, see ten to twelve turkeys feeding and occasionally moving towards me. I debated to charge and break them up, but thoughts of falling on the decline entered my mind. I waited. Birds were at my range of about 38 to 40 yards at various times, but vegetation removed any chances. I felt my shot would come! Suddenly, mom moved straight up the hill and birds followed. Her head came up and that dreaded sound of an alarm putt was heard. She began moving away. I could not shoot at anytime because I would have taken multiple turkeys! She had seen the orange for 95% of me was behind the tree and I was motionless! I tried to break them up and most flew away together. However, once Bob reached me a lone hen came past us, but his shotgun wasn’t in position and mine was on the ground since I was trying to get him a shot. We saw another turkey fly out of a tree. 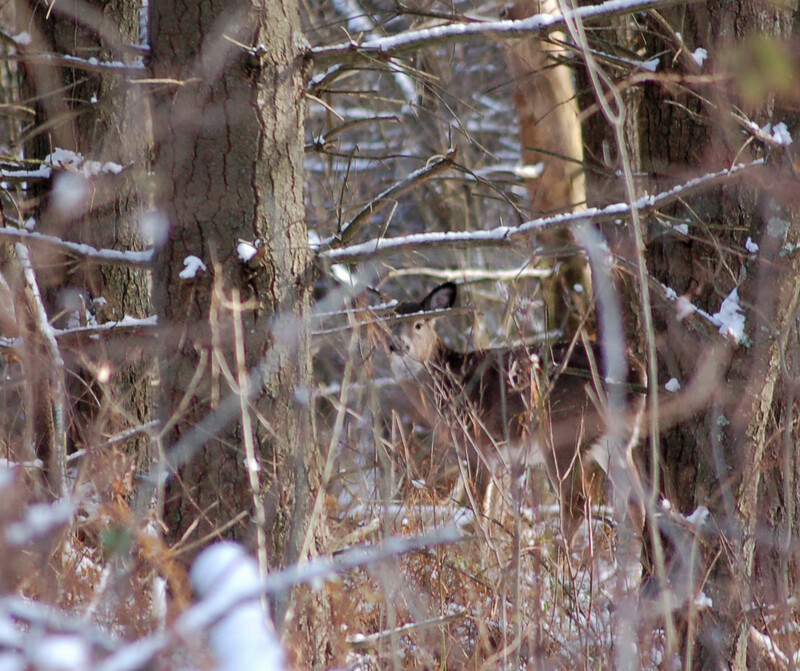 Later, I spotted a buck bedded down. I tried to get into a position for a great camera shot, but he wouldn’t have it. I did get a pic once he was up. We quit around two o’clock. Tuesday, November 4th, found me , once again, trying to spot roosted birds along the eastern horizon. the winds and noise made hearing any roosted birds nearly impossible unless one was close. I hiked all around, but never saw a turkey. Where did they go? 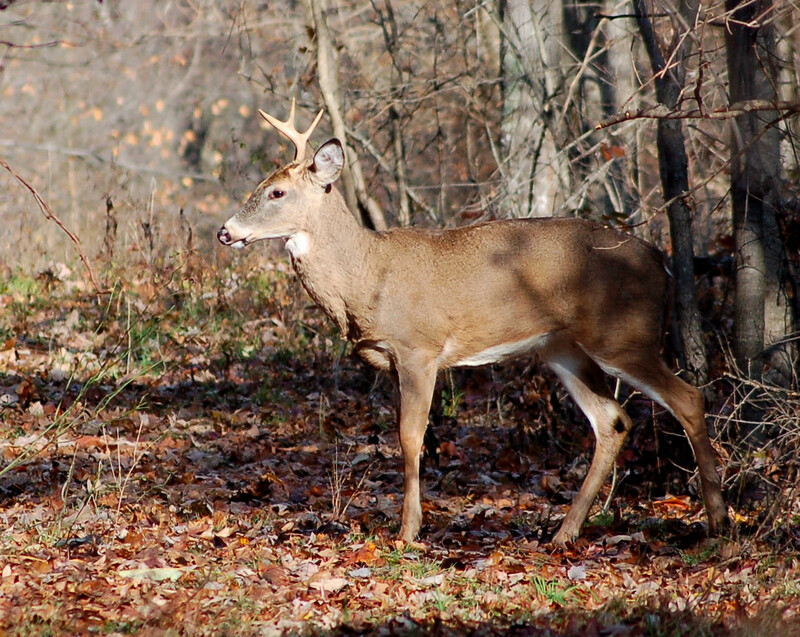 I spotted a buck standing and after a time, he bedded down, I back-stepped to avoid scaring him. I saw other deer as well. I went south and parked to hunt another area. I walked and called along the way. The wind made hearing almost impossible. 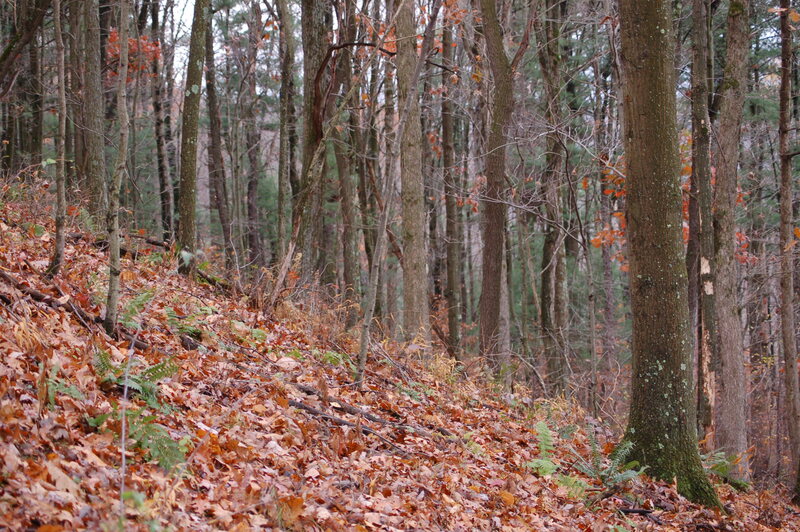 I walked around an edge and spotted a mature gobbler about sixty yards away. We stared each other down when he and four other long bearded birds began to walk away. I instinctively moved a s quick as I dare and attempt breaking them up. They went over the side and when I came over I was only about 35 yards from them. they flew across the hollow together. I failed another breakup. The temps were up and I was tired and hot so I quit about 2:50. 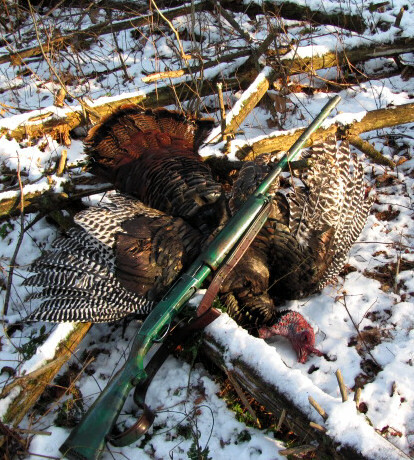 I had resigned myself that the 2013 fall turkey season would probably be a turkey less year. The leg issue, luckily, has been healing well. I had not hunted much at all this season! Note remnants of an old stone fence. 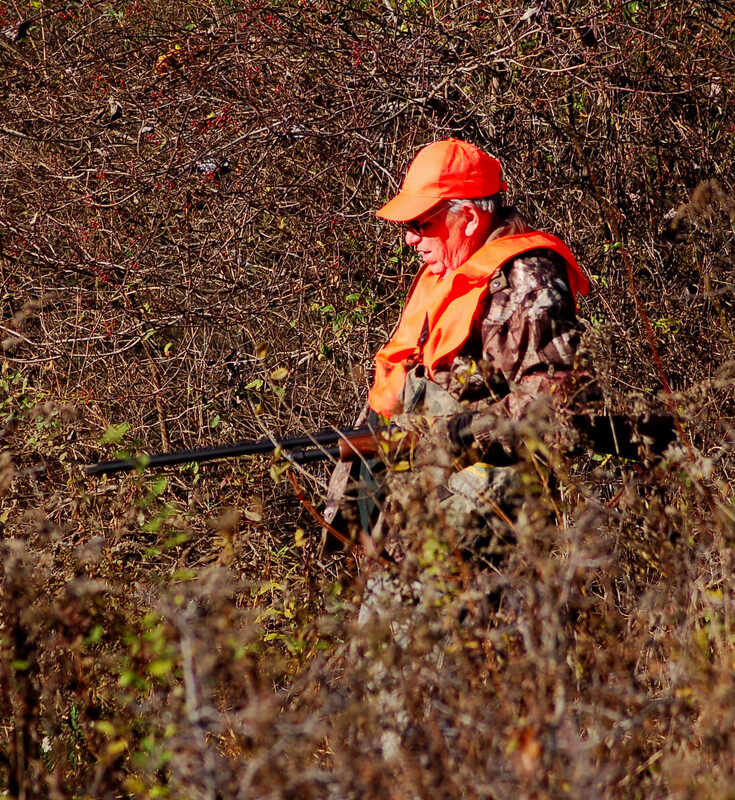 The Pennsylvania bear season was over and the last few days of the fall turkey season began on Thanksgiving Day. 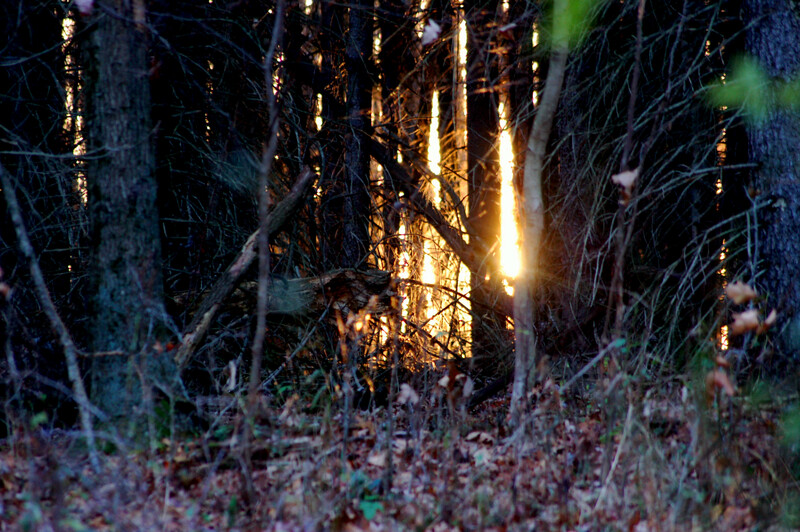 This morning, I was entering the woods hoping to find some turkeys to hunt. I walked up along a hill and found where two turkeys had walked across a gas line yesterday. I left their tracks and quickly moved towards an area where the birds sometimes like to roost. 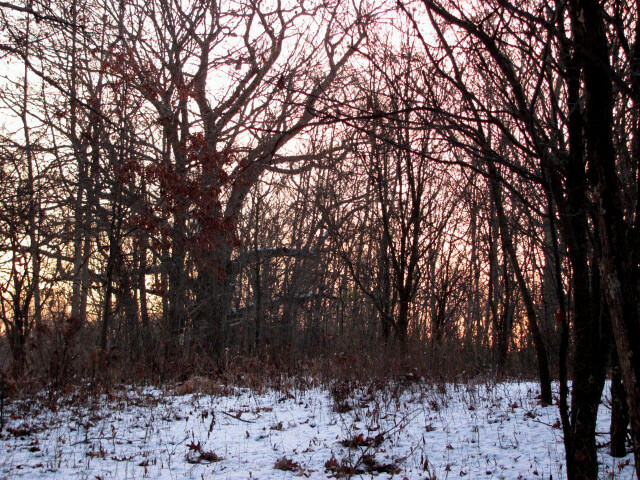 In minutes I could see a turkey in a tree silhouetted against the pre-morning eastern horizon. I imagined more birds were scattered nearby so I closed in for a break. This is my preferred method of hunting turkeys. Scatter them, if possible, then call one back in. One lone bird flew from the tree. After a short break to listen I elected calling to see if the turkey might answer me. Nothing happened so off I went searching, and hoping, for a flock of gobblers I had seen a couple of times in October.. 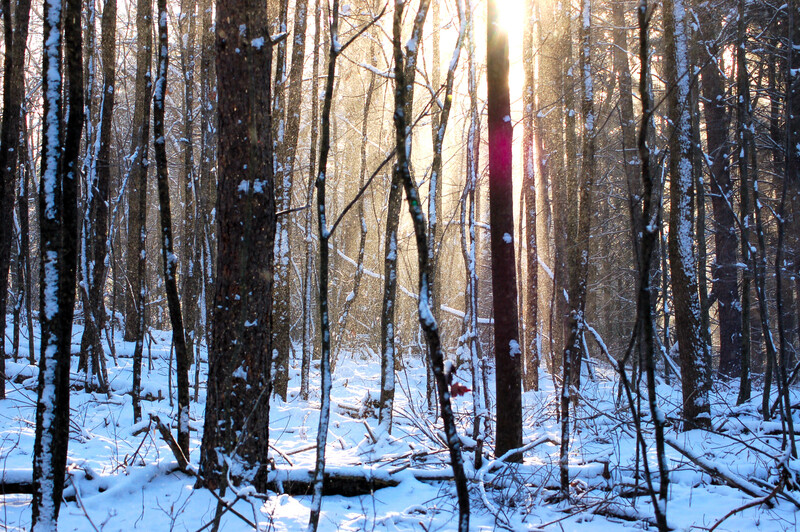 I called periodically as I walked along across the ice-crystal, laden snow cover. I wondered how hard it might be to walk up on turkeys. Suddenly, I received an answer and I set up to try to call the bird in. I watched and called and as the yelps came closer the turkey sounds abruptly stopped. I pondered what could have happened when I saw the large dark animal move through the woodlands. I was seeing a fisher! 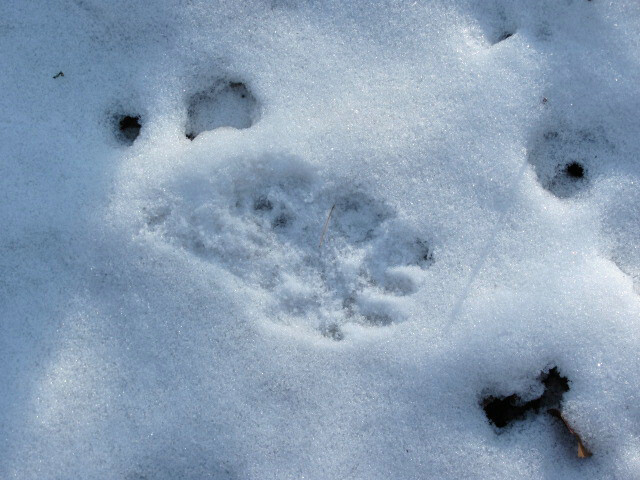 I would see plenty of tracks as I walked along. I circled around to close the distance where I had heard the turkey. 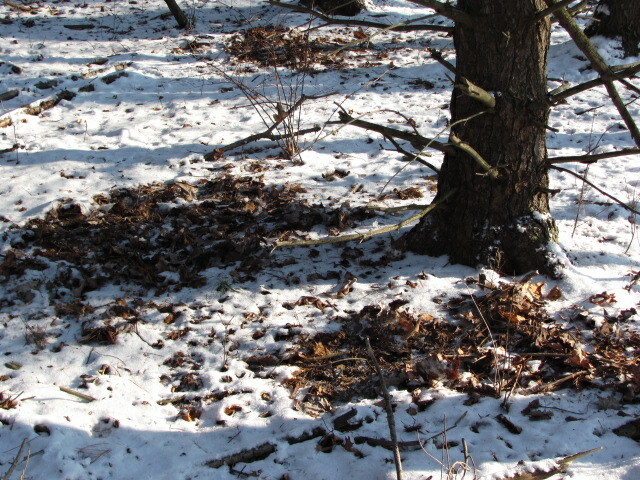 Gobbler tracks were easily viewed. I approached the crest of a round top when the undeniable sound of nervously moving turkeys was heard just over the crest of this hill. I moved as fast as I dared and began hollering as I watched six to eight turkeys running and taking to the air. I could tell, at least, some were gobblers. I walked through the break-up attempt zone and moved about a third of the way downslope on a steep hill-side. I called home to tell my step-father, Bob what had happened and if interested get here as quick as possible. He arrived about one and a half hours later. I began calling loudly using gobbler yelping. A full hour elapsed when I first saw the turkey downslope and to my right. The bird began walking up the steep hill and became lost to my view due to the terrain. However, I could hear him walking. I spotted the gobbler and could see a beard dangling from the breast. 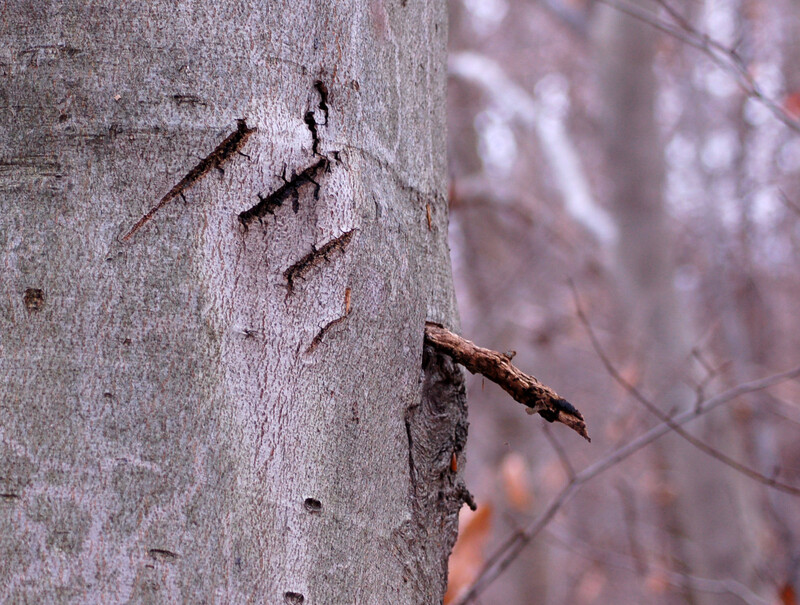 His eyes went behind a tree allowing the Remington 870 sight to lineup. The tom walked from behind the tree and the 40 yard shot was true and a fine gobbler was down. My rule of thumb is to try to limit my range to about 35 yards, but details of the hunt wouldn’t allow any further chance due to tree tops on the ground. 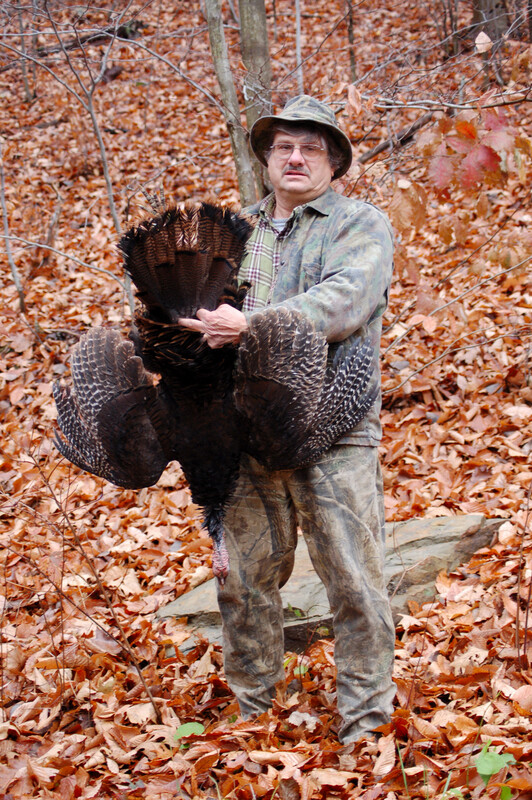 The gobbler sported an eight inch beard and two 5/8 inch spurs. 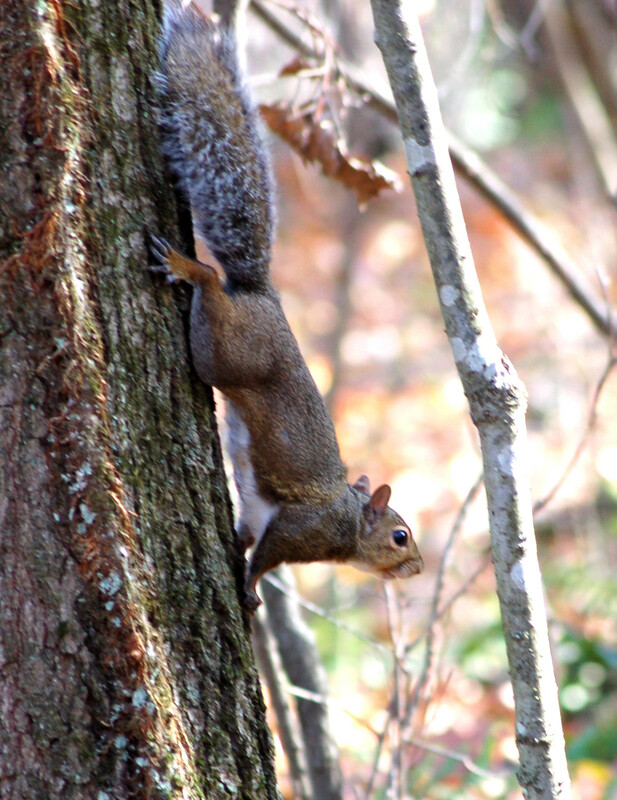 Other sightings were a handful of deer and some squirrels. Those who know me can relate my love for the outdoors at this time of the year. They’ll, also, relate to my love for hunting fall turkeys. This year due to leg pain issues my hunts are few and short. I utilized crutches for four days recently. I had leg pain so extreme I couldn’t walk and a specialist told me that he expected I had a blood clot. he sent me to the emergency room where ultra sound and X-rays proved I had an acute led sprain. I have been taking physical therapy. The therapist told me hunting and hiking would not be the best thing I could do, but he didn’t say I couldn’t just don’t over do the excursions. 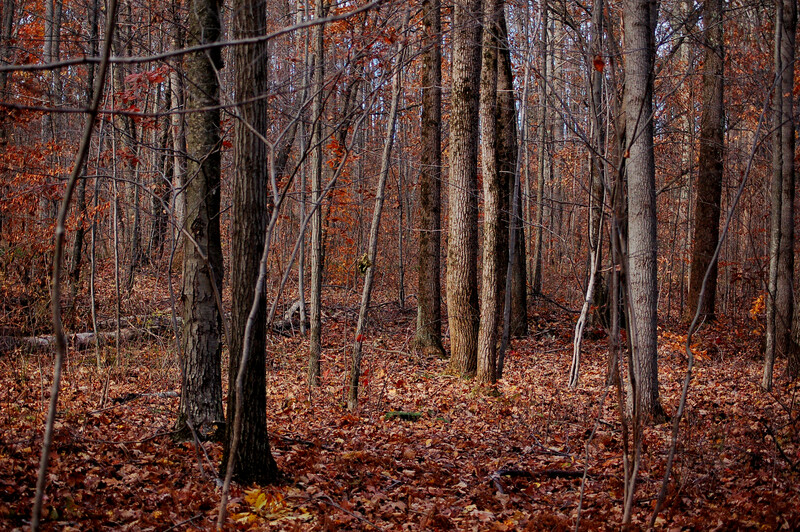 The third day of the fall turkey season found me hunting for a couple of hours. I did see eight turkeys in a field and later I walked into them. I hollered with an attempt for a good break but failed. I could have harvested any of 4-5 turkeys at that time, but I prefer to call them in. The following morning, my step-father, Bob Miller and I went out for several hours. We, both heard roosting turkeys. I decided to try my luck at long-range calling instead of hurrying across the hollow for a break. The birds went off feeding. Bob, later saw 10-12 birds in a field near to the roost. I had a hen flush in front of me, but I failed to try for a shot. That kind of turkey hunting isn’t the way I hunt, but maybe I should have taken her due to my experiences. Two morning later I failed to hear roosting birds. the high winds effectively lessened any chance to hear far birds. However, I walked onto a bird on the roost. I debated taking the shot, but elected to wait. All of these hunts were only a few hours at a time at the most. This is difficult for me, but the pains dictate how much effort I can do in my pursuit of a wild turkey. 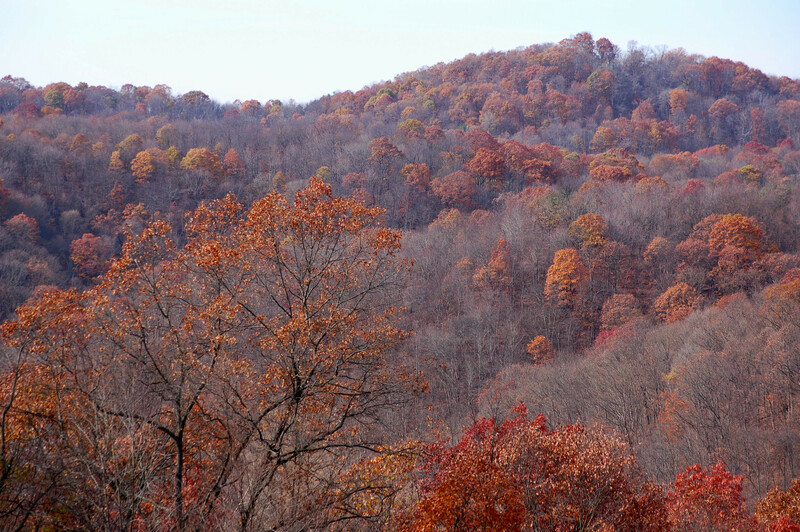 I have seen beautiful autumn scenery. 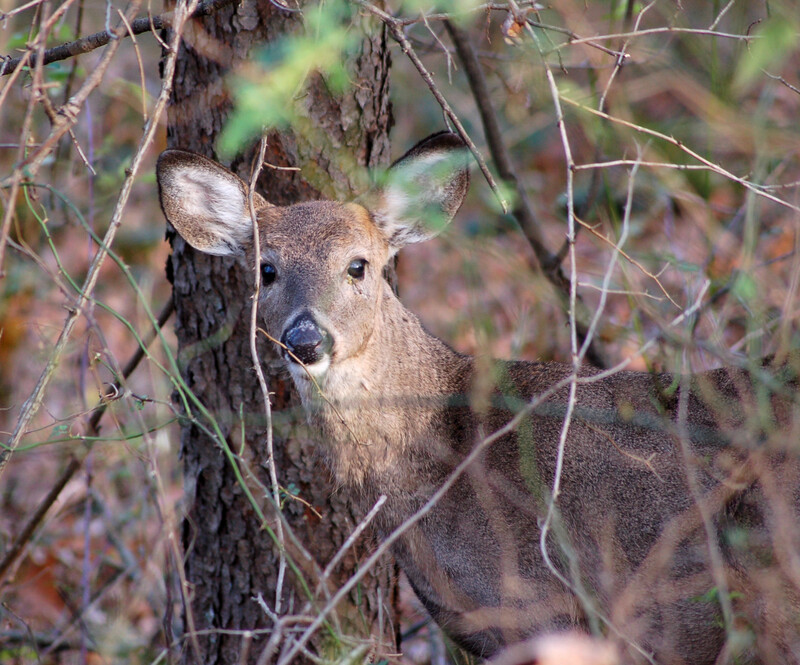 I have seen many deer including a number of buck. 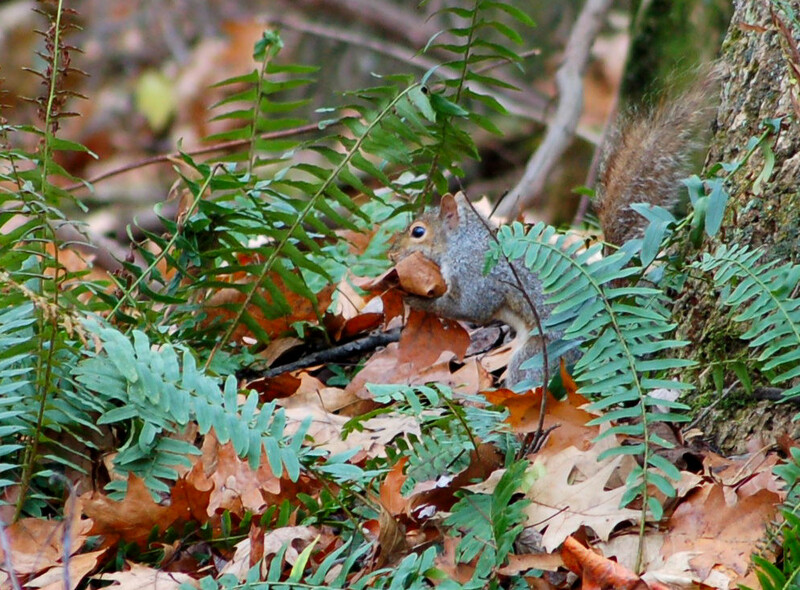 I have seen lots of gray squirrels and a few fox squirrels. I even saw a cottontail. I had the pleasure of listening to a great horned owl serenading the early minutes prior to sunrise. I will try to hunt, again, after a few days and challenge myself for a successful hunt. Bob and I made plans to hunt for turkeys for a few hours. This morning, I placed Bob about one-third of the way up the hill. While hunting bear I had heard turkeys on the roost along this steep hollow and later saw the flock directly across on the other side of the hollow. I had hoped this might be a favored roosting site. 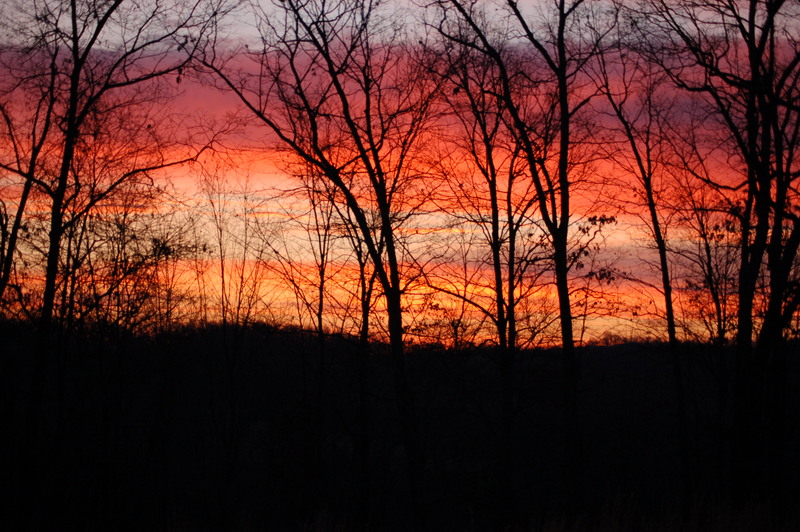 The very early morning sky was red and orange. The western sky had clouds coming in fast! the breeze soon turned into noisy gusts. I circled up and over and I couldn’t hear any roost talk. I continued moving about to no avail. The birds just were not in this area this morning. I did see two deer and heard two owls. I wasn’t sure of how well I did with the break, but I located Bob and we returned to spend over an hour calling to no avail. The winds were strong, the rains were noisy on the dry leaves and the road noise was bad despite being the day after a holiday. We quit about 11:00 and headed home.